Roxy Palace Casino’s new slot offers the chance of three bonuses, free spins and exploding wilds. Roxy Palace Casino :: NEW Video Slot - Bust the Bank :: PLAY NOW! Bank robbers Larry and Bob lead players through the latest video slot launched by Roxy Palace Casino this week, a 5 Reel, 243 Ways-to-Win gambling adventure titled BUST THE BANK. As the name suggests, the objective here is to access the substantial rewards hidden in the bank’s imposing building. 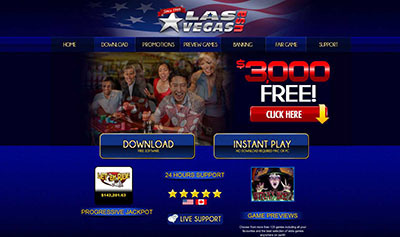 The player’s assisted in doing this with a range of “tools” that includes three different bonus opportunities, Free Spins, Scatters and truly explosive Wilds galore. Guarding the bank’s assets are frighteningly fierce guard dogs, equally mean-looking security guards and other security measures like armoured vans and bulging safes. When the Safe Bonus logo appears on Reels 1 or 5 in any position, expect between 1 and 6 randomly awarded floods of gold coins. 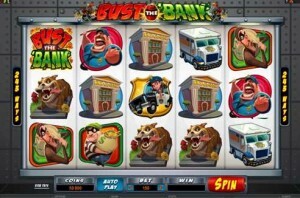 The Bust the Bank logo is another useful tool, helping the player to build the right combinations for reward opportunities by substituting for all symbols except the pig, the Scatter bomb or the safe. When the Scatter Bomb symbol appears, the player is in for an exciting Free Spin ride. 3, 4 or 5 Scatter Bomb symbols across the Reels triggers 8 Free Spins…and if the Scatter comes up again during this round, an extra Free Spin awards. To add to the thrills during your Free Spin ride, Reels 1 and 5 are truly Wild! Talking of Wilds – watch out for the Piggy Bank Smash feature, where a giant, gold-filled pig appears on Reel 3; click on it and the Piggy Bank Bonus delivers an impressive Smashing Wild coin reward. If bank robbers Larry and Bob happen to be skulking around, there could be extra wins there, too. The wagering range on this game can be as big or as small as the player wishes; from a max bet as high as 300.00 to a mere 0.30. In return the punter gets a crack at rewards that in the base game can top 82,000.00, on Free Spins 135,000.00 and lesser but still substantial totals on the three different bonus opportunities. 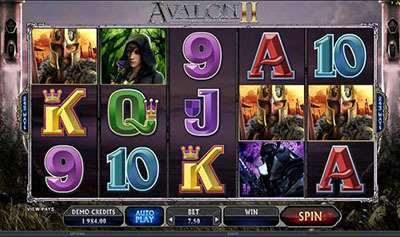 The theme for this new slot is carried by colourful and light-hearted graphics and amusing sound effects. Bust the Bank is one of those big, truly entertaining and multi-featured video slots that deliver plenty of action to the player – try it out today at Roxy Palace Casino.